Archibald Kay (1860-1935) was born in Glasgow, Scotland. Kay from his earliest years as an artist focused on painting landscapes. He initially studied in Scotland, and later at the famous Academie Julien in Paris. 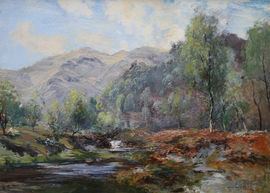 Kay was president of the Glasgow Art Club and was also a member of the Royal Scottish Watercolour Society, Royal Scottish Academy, and the Royal British Colonial Society of Artists.